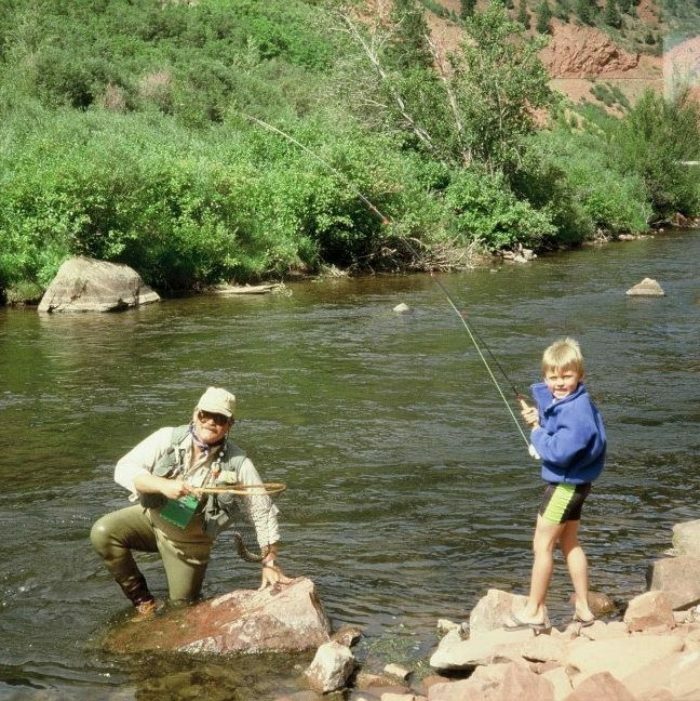 Fly Fishing started for me when I was the size a of a sack of potatos. Growing up with two teachers for parents from central rural New York with a passion for the Rocky Moutains and its drainages no question has lead me to where I am with my family today. From when I was three years old we started the annual road trip pilgrimages, site seeing, fly fishing and camping across the country. Our destination was to reach the continental divide and its many trout rich rivers. One of my earliest memories was on the Green River. My father and I set out to do some fishing or at least he did and was stuck with me as was often the case. Me not yet being big enough to fit into any size waders I would be carried on my fathers shoulder like a sack of potatoes! He would do this as he waded out to a rock to perch me on to fish alongside him. Me being a lefty and him a righty we would get to share in each other’s company while fly fishing. This momentious day the location he chose had trout stacked up like cord wood right at our feet. You would see them everywhere in the water column literally crashing into our legs as they fed veraciously. We were nymphing for them. I had my 7’ 5wt we had picked up in our travels and was my first fly rod. We used the old indicators that you would tread on the leader and then secure into place with a half of a tooth pick. We were catching landing and releasing trout one after the next! Then it happened, I got my first tug of a trout that was the size my father referred to as a “man bear pig.” This fish was ripping at rod and reel. The drag screamed as I had never heard or felt it. The fish burned out all my fly line and into the backing. I could see my father was sharing in the nervous anxiety that comes with this sort of experience. The fish had gone down around a huge boulder connected to the side of the rivers bank we were fishing still pulling line. My father asked if I would like him to try to chase it down the bank. I agreed as I didn’t have the skills or the ability to move let alone get over the huge rock. He quickly disappeared over the boulder chasing the fish down stream. When he returned he informed me that the fish had gotten away. Any angler will tell you it’s not the fish you caught you remember it’s the ones that got away! Now a guide myself 30 years later I still vividly remember that trout. It had got me hooked on the sport and of course got away.